As its name might suggest, the Instant Pot Aura Pro Multi-Use Programmable Slow Cooker with Sous Vide is the only Instant Pot model with a built-in sous vide cooker. 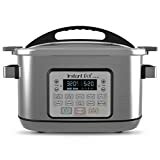 That means on top of the 10 other cooking modes this excellent 8-quart Instant Pot supports, it can replace a dedicated sous video immersion cooker like ones you might buy on Amazon for as much as $200. With that in mind, this model’s $160 price tag is more than reasonable. But if you clip the $24 coupon on Amazon right now, you can snag one for just $135.99! The coupon sold out pretty quickly last time Amazon offered one on this great multi-cooker, so you might want to hurry if you don’t want to miss out.